Are you ready for the ski season? Do you find yourself daydreaming about Lone Peak Tram laps? Are you ready to rally runs on the Challenger Chair? Will you be hiking the Headwaters all day long? Are you the person doing bump laps on Mad Wolf? Are you keen to earn your turns by making backcountry laps in Beehive Basin? Or are you just interested in logging the elusive 100+ day season? Whatever your ski season goals are, you need to get in shape for ski season. Right now is the time when you need to focus on getting in shape for the winter. Don't put it off. Being physically fit and ready to go when the snow starts to fall and the lifts start to spin is essential to maximize your enjoyment and reduce your risk of injury. Skiing and snowboarding are sports and they require you to be on top of your game. Ideally getting in shape for ski season will be an easy transition for you after a busy summer of hiking, biking, and climbing, but even if you're just getting off the couch or recovering from an injury with the right fitness techniques and work out strategies you can boost your physical fitness before it's time to hit the slopes. These fitness pros will help you get in shape for ski season. Start now and this could be your best winter ever. One other recommendation to maximize your fun on the mountain: Take a ski or snowboard lesson from a certified, professional instructor. 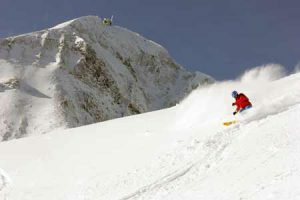 Their expert advice can boost your skiing efficiency and fine tune your technique in all terrain and conditions. Combine this with solid physical fitness and you'll be unstoppable!